Don’t stop! If you are sliding off the road, headed towards a drift, slush pile, etc. and do not stop. Your vehicle’s momentum can carry you out of the mush. The same goes for when you are stuck and get some movement. Don’t stop until you are absolutely stuck. Even a little bit of constant movement is better than just spinning wheels. Don’t spin the wheels. When you are stuck and your tires are just spinning, stop. Unless you are on solid ground (concrete or asphalt), stomping the pedal and spinning the wheels is just going to make it worse. Apply proper power. Use your throttle sparingly and in the right way. If too much power is overpowering the tires and snow, use part throttle. You’d be surprised how less power might just get you out. Shift to low. Make sure your automatic transmission is shifted into the lowest gear. For manual transmissions, you actually want to shift into a higher gear, such as 3rd or 4th, and use the clutch to control the spin. There will be less shock on the tires and you will have more control to keep the tires from spinning. Rock it, baby. The classic ‘unstuck’ move is called rocking. This is a maneuver where you use the engine to roll the vehicle forward, put it in reverse, roll it backward, and then shift to drive and roll forward. Doing this several times builds momentum for the vehicle, often getting it out of the rut it is stuck in. Once you are over the hump and rolling in one direction, power out of the mess until you are on solid ground. Use traction devices. It is too late to add chains or cables to your tires, but you can use other items to enhance the grip of your tires. Rocks (quarter size and smaller), sand, even small branches and sticks can give you the grip you need to get out. It is a good idea to carry a bucket or bag of sand, pebbles, kitty litter, etc. when you live in snow-prone areas. 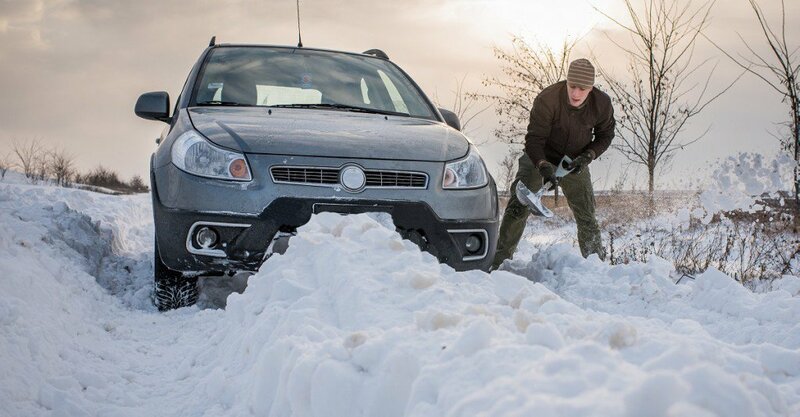 Kitty litter, in particular, is one of the greatest all-time fixes so keep a small bag in the trunk during the winter. Go straight ahead. Make sure your tires are pointed straight. There is considerably more stress on the tires when they are turned. This means it is harder for the vehicle to move, and therefore easier for the tire to spin rather than get traction and push or pull the vehicle out of the mess. Let some air out. When you just can’t get the grip, try letting some air out of the tires. This makes a wider contact patch and can give you the necessary grip to get out. Just don’t forget to inflate the tires to the proper specification as soon as possible. Until you get the tires inflated, keep the speed down so you don’t ruin your tires. Life’s a snow garden, can ya dig it? Sometimes, you just have to get down and dig. Carrying a camp shovel will make this easier, but a stick, wood board, or even a plastic cup can get the snow and mud out of the way. The idea here is to dig a long ramp from the tire to the flat ground instead of a deep sudden rut that you likely find yourself in. Additionally, there may be a large mass of snow under the chassis, making it difficult to move. You need to try to remove as much of this as possible. Active Insurance is a Chicago car insurance agency that provides auto insurance options to fit the needs of Illinois drivers. We also provide roadside assistance for $39 per year, and it includes 24 hour emergency towing, tire service, battery service and lost key/lockout service. Contact us for more information. *This article was originally published by Jefferson Bryant on Napa Know How Blog.